There’s very little that’s soothing about transcontinental flight. Cramped seats, noisy passengers, the knowledge that nothing but prayer and magic is keeping the plane in the air—all of it conspires to make crossing the ocean by plane an exhausting experience. Distance yourself from all the inconveniences, though, and air travel takes on a quiet beauty. 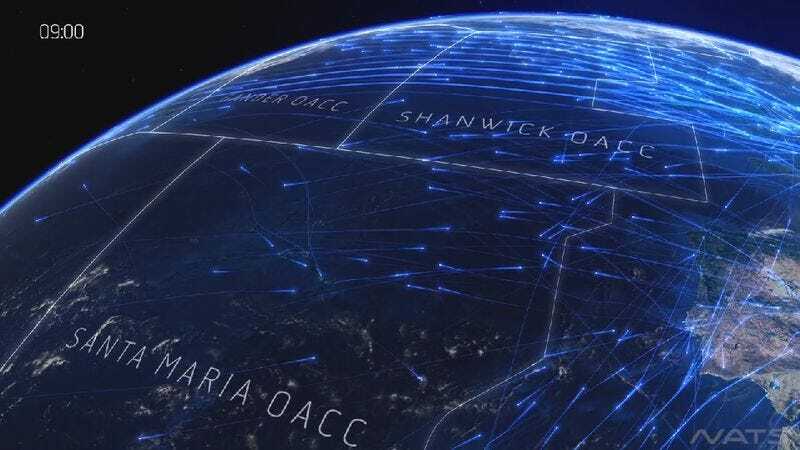 That’s the takeaway of this video, produced by air traffic control provider NATS Holdings, showing all of the flights over the Atlantic on a given day in August 2013. The 2,524 planes that flew that day are rendered as glowing blue dots, gliding across the ocean, with no indication of the spilled drink carts, sweaty, smelly people, and screaming children trapped within. Instead, there’s just the hypnotic pattern of tens of thousands of people moving in even, straight lines across the vast distance as music pulses in the background. Besides the video’s aesthetic pleasures, the coordination of thousands of planes, and the knowledge that it’s happening every minute of every day, is legitimately impressive (as is this video, produced a few months ago, showing all of the flights over Europe, which makes up in logistical fanciness what it lacks in sheer, soothing beauty). North Atlantic Skies from NATS on Vimeo.